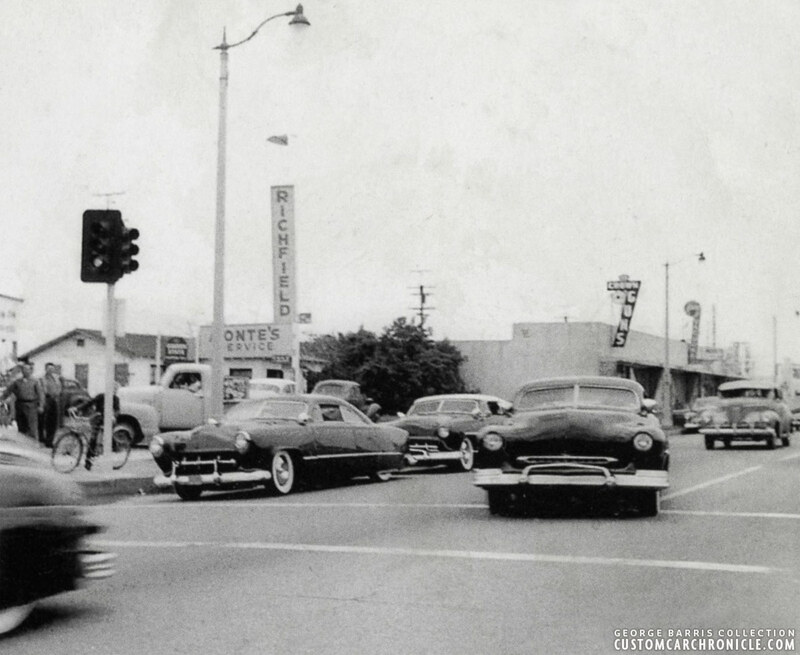 Iconic Barris Kustoms cruising the streets of Lynwood California in the early 1950s. Lets take a closer look at this unique photo. One of those early photos that makes me want to go back in time and actually see these early 1950 Custom Car Icons drive by… on their way to a local, or not so local car show. George Barris used this amazing photo is his Kustom Techniques of the 1950’s Volume 3 book. It was used pretty small, around 4″ wide, but it made a huge impact on me… and I know on a lot of people. Why? We are so used to see the Golden Age Custom Cars posing in nice locations, or at indoor or out door shows. But very seldom do we see a photo capturing these Customs driving on the street, let alone with no less than three iconic Customs driving taking off at the stop sign in one single photo. We are no so much used to snap as many digital photos as we like. Not only from the car shows we attend, but also from the trip we take to get there. 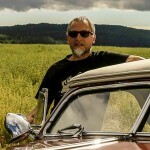 I took hundreds of photos each trip I take with my good friends from the Kustoms Denmark club from Denmark to Sweden. And we are getting more an more used to see the modern day Custom Car cruising to the car shows, or just for fun. But back in the 1940’s and 1950′ taking photos was still rather costly, and I guess they just did not think anybody would be interested in the road to the car shows. 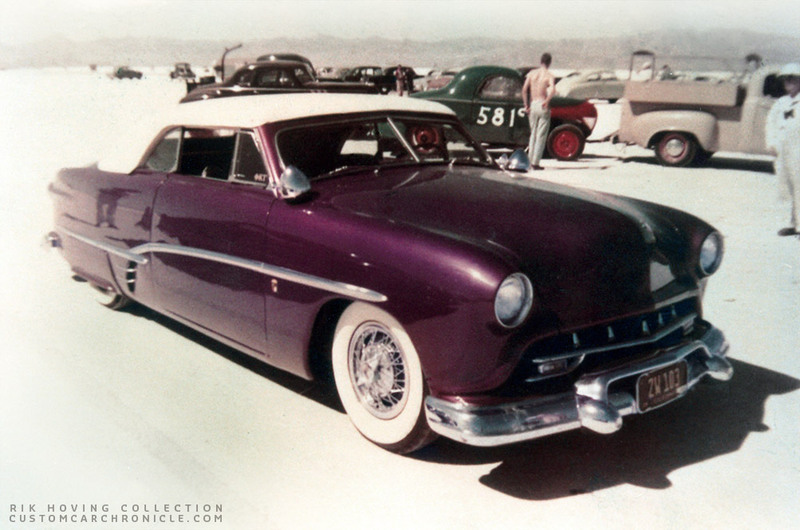 Thats why this photo of the Louis Bettancourt Mercury, the Panoramic Ford and the Chuck DeWitt Ford with padded top and an unknown Barris ’46-48 Ford Coupe is liked so much. 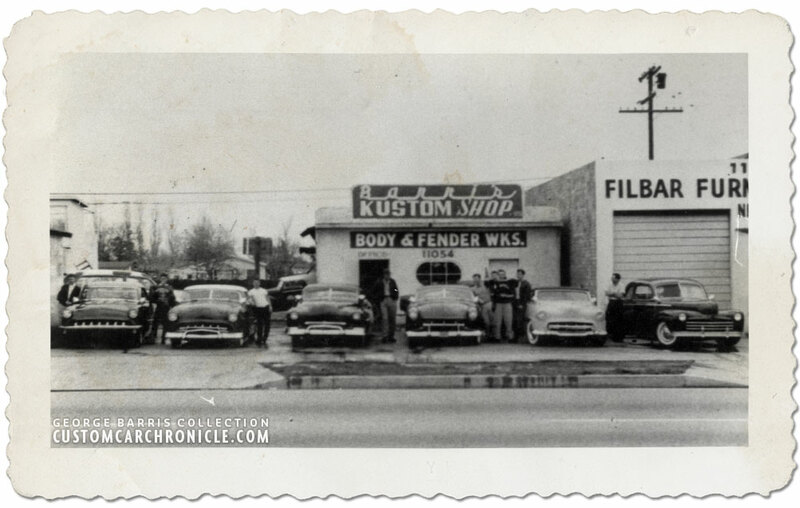 This photo takes us back in time, lets us cruise with the fantastic Custom Cars of the early 1950’s we all admire so much. Seeing these Custom Cars in their natural habitat is something really special. It is unknown who took the photo, and even when exactly it was taken. I estimate it was that the photo was taken in either late 1953, but more likely early to mid 1954. We don’t know who actually took this amazing photo, and from which car. Some of the mysteries of those old photos that we most likely will never find an answer to. But we do know that whoever took this picture captured a wonderful scene, which is still being talked about 60 plus years later. The photo captured the rear side windows in place on the Buster Litton Panoramic Ford, a rare sight. Notice the people on the side wall all staring at the Customs. The location where the take off photo was taken seen from the Barris Kustoms Shop. 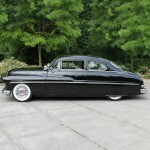 Louis Bettancourt 1949 Mercury restyled by the Ayala’s later redone by Barris. Panoramic Ford restyled by Barris and George Cerny, originally owned by Buster Litton, later by Don Shaedel. Chuck deWitt 1950 Ford convertible with padded top restyled by the Barris Kustom Shop. 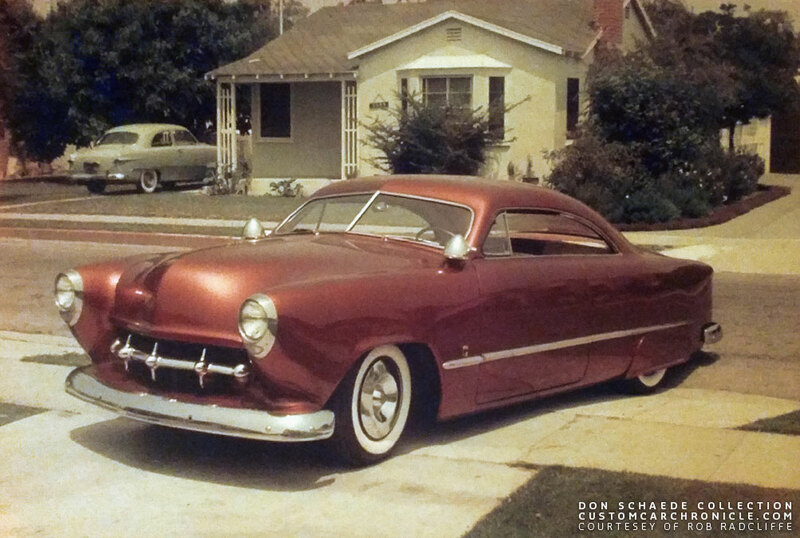 Most likely this 1946-48 Ford long-door Coupe restyled by Barris for an – so far – unknown owner. 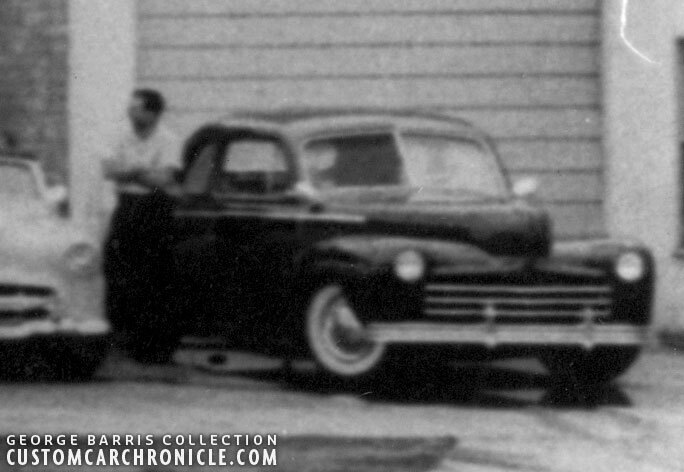 The same ’46-48 Ford Coupe from the Line up photo in front of the Barris Kustoms Shop photo. The photo was taken close to the Barris Shop across the street on Atlantic in Lynwood on the the corner of Elmwood Ave (red dot). Right across the street from the Barris Shop. 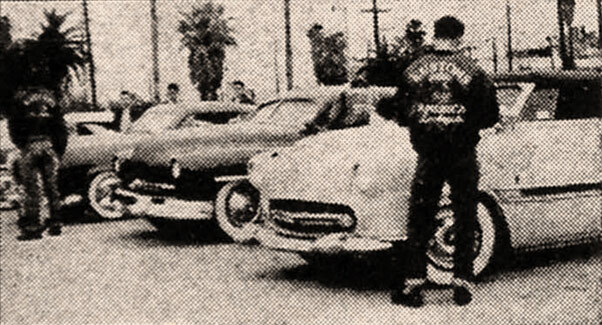 Four of the Kustoms of Los Angeles club member cars we can see in the Cruise photo are also captured in this photo taken at the Barris Atlantic shop. Possibly this photo was taken prior the one taken at the stop light. We can see the following cars in the picture from L-R: Nobby Miyakawa 1952 Mercury “The Japan”, Chuck DeWitt 1950 Ford convertible, Louis Bettancourt Ayala/Barris 1949 Mercury, Buster Litton’s Panoramic Ford, Tommy Thornburg’s 1947 Studebaker, and the unknown 1946-48 Ford Coupe with the Plymouth ribbed bumpers we can see on the far left of the Cruise photo. George barris could sadly not remember where the trip went to. One thought is that the photo was taken on May 14, 1954 and that the guys were going to the one day free car show at the Thrifty drug store on Rodeo Rd and LA Brea. 3 out of 4 of the cars we can see in the Cruise photo also appear in the famous Parking Lot Photo at the Thrifty drug store. And 4 photos from the line up at the Barris shop above appear at the Thrifty store show. (The only thing with this photo is that the Panoramic Ford was most likely already owned by Don Shaedel, since he can be seen in the photo cleaning the car. But we do not know for sure who owned the car in the Cruise photo) Since all these guys were all in the Kustoms of Los Angeles Club, we know they cruised a lot together and hung out most of the weekends driving to local shows, or drive-ins. Again we most likely will never find out, but its just nice to examen these pictures and day dream about them. 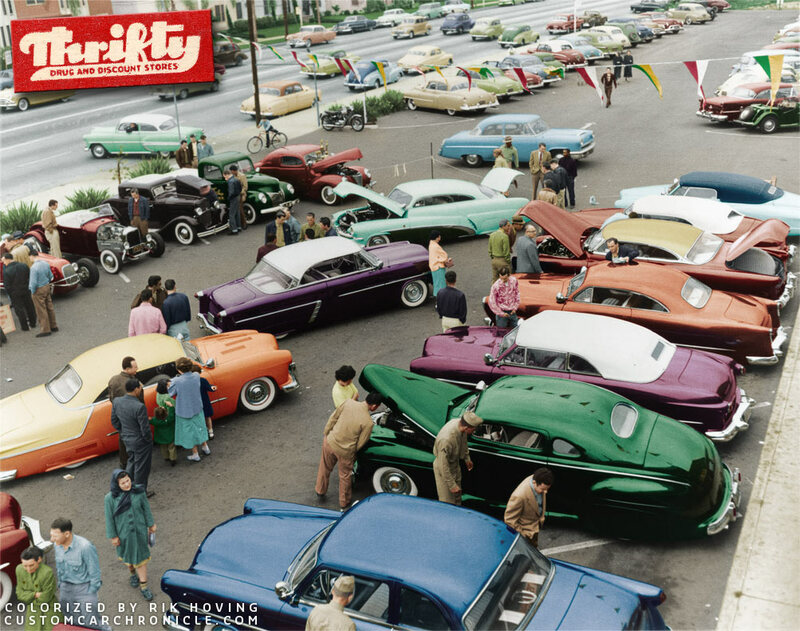 Parking lot show held on May 14, 1954 at the Thrifty drug store parking lot. In this picture we can see 4 cars that also appear in the Barris shop line up photo: Tommy Thornburg’s 1947 Studebaker, Buster Litton’s Panoramic Ford, Chuck DeWitt 1950 Ford convertible, Louis Bettancourt Ayala/Barris 1949 Mercury (on the far left showing only the front fender, hood and front bumper). In one of the Kustoms of America magazine ads George Barris used this photo of another show attended by some of the Kustoms Los Angles club members. Tommy’s Studebaker, Louis ’49 Merc, and The Panoramic Ford and possibly the Chuck DeWitt are in this photo. Another possible goal for the Cruise photo trip. Sadly there is no other info known about this photo. It was used very small in the ad, hence the poor quality. 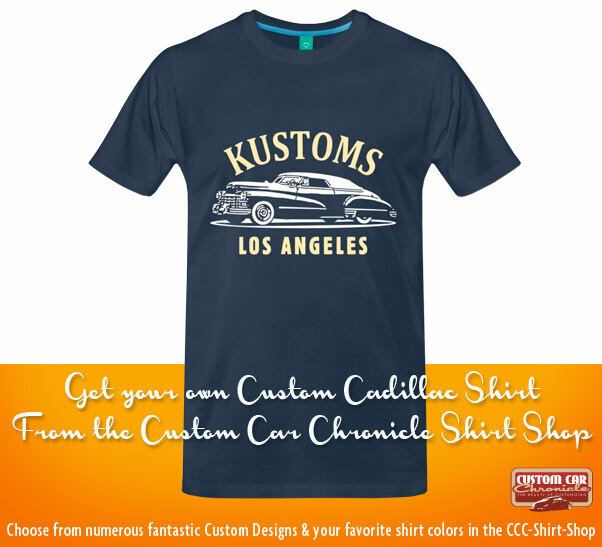 Especially with the stories we have heard about the guys in the Kustoms LA club. Stories like in earlier years when Jack Stewart was still driving his Ayala/Barris 1941 Ford, how he always had to lead the cars on their way to a car show, or out of town up to Balboa or other places. Jack’s Ford had its windshield cut up into the roof, and he was the only one that had a good vision on the stoplights. So he always lead the way. Jack also told stories about him and George Barris driving back from car shows or dances together in one of their Custom Cars. How Jack was driving while George was sleeping on the passenger seat, and Jack stopping at each gas-station to splash some water on his face to stay awake. How some of the guys also stopped at the gas-stations to see if they could get some free gas left over in the hose, by pulling it up high at the pump. How the Kustoms of LA club members drove up in a convoy to Big Bear were they rented a cabin and spend the weekends with the guys and their girlfriends. All great stories, but sadly so far very few photos have surfaced of these events. 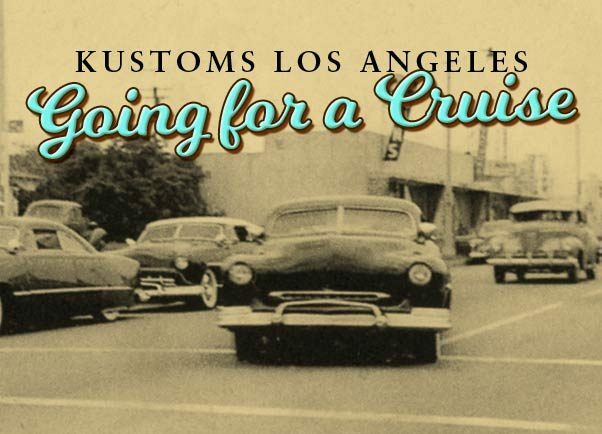 That is why this one photo of the Kustoms of LA guys going for a cruise is so important. I have always had a fondness for old custom car pictures that show the car in a location where they were being used for transportation. Parked along curbs or in front of the house and especially on the street were all cool settings. One of the best Kustom photos ever taken. Now that you put the shop front photo in the same article as the Atlantic Ave. shot, I would definitely think they were taken on the same day. Judging by the gloomy sky, wet ground, and Buster’s side windows in place, it was probably a cold morning on the way to a car show. Shhh. I’m dreaming about standing on the corner with the younger guys watching the coolest of the cool slide away from the curb in their fantastic (k)customs.. Ahhh. Rik, I wonder whereabouts the Thrifty was on the map above. Would be neat to imagine the route that might have been taken had that been the destination. Thanks for taking us back – even for a moment. 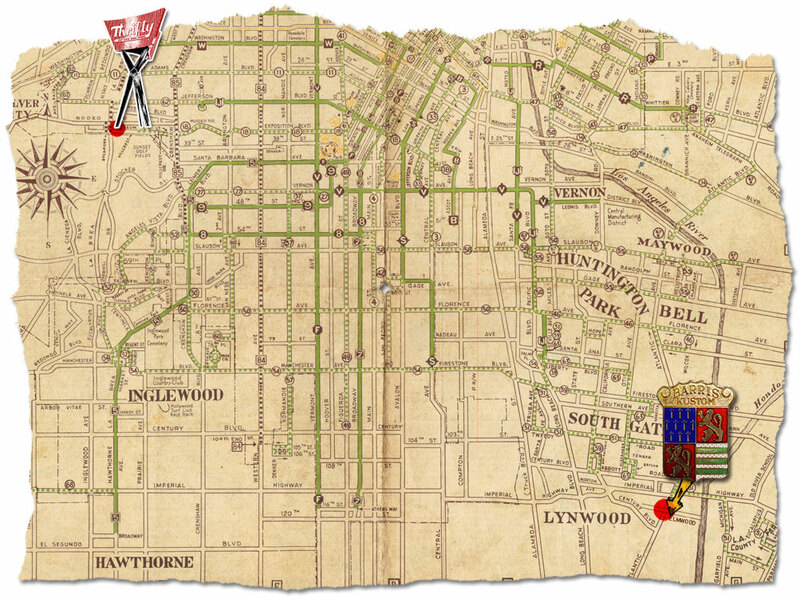 I made a new map Dave, a larger section that shows where the Thrifty store is, compared to where the photo was taken. That’s a bit of a drive isn’t it! Thanks Rik! The cruising pic was taken almost directly across the street from old Barris shop. They are on Atlantic and Elmwood, traveling south on Atlantic. Not sure if Elmwood had a different name back then or not. If you stand there today you can still see a few remaining things from this picture. I love this picture, I have it blown up in my living room. I have always wondered about the car in the bottom left corner with the 49 Plymouth bumper!